The Light You Need, Without the Heat! Chauvet's SlimPAR 64 LED par-style lighting fixture is a simple solution for the complex problems that plague traditional incandescent par lights. Instead of unreliable gels that burn out mid show and only offer a single color, the SlimPAR 64's array of high-intensity red, green, and blue LEDs let you create millions of colors that can change and pulse with the beat. A low-profile design also lets you position the SlimPAR 64 in places too small for traditional par lights. And since LEDs produce very little heat, you won't crank up the temperature when you light up your stage or dance floor with Chauvet SlimPAR 64 par-style lighting fixtures. One of the nicest things about LED technology, aside from its low power consumption and low heat output, is that it takes up less space than conventional incandescent lamps. That's why Chauvet was able to give the SlimPAR 64 such a low profile. No more than 2.5" deep at its thickest, the SlimPAR 64 fits inside trusses and other tight spaces that are too small for conventional fixtures. 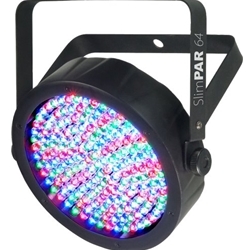 For most live music lighting rigs, the SlimPAR 64's built-in programs are all you need to add an exciting atmosphere to your shows. Chauvet loaded the SlimPAR 64 with an excellent selection of macros you can use, so you don't need to manage a DMX controller. Thanks to its built-in microphone and sound-activation mode, the Chauvet SlimPAR 64 can listen to your music and lock its tempo to the beat. You can even link multiple SlimPAR 64s together in master/slave mode to create impressive light shows with just the push of a button. If you're already running a more complex DMX-based lighting rig (or plan to do so in the future), then you'll love howe easy it is to integrate your Chauvet SlimPAR 64 into your setup. It offers your both 3-channel DMX mode for simple color mixing and 7-channel DMX mode, which gives you remote access to the SlimPAR 64's programs, pulse/strobe effect, and other onboard running modes.